Have lots of onions from your garden or a bulk purchase? With the proper storage technique, they'll keep for months and months. Even cut onions will last quite a while if you store them the right way. Here's what you need to know to maximize the storage life of your onions. Sweet onions, produced in early summer, have a high moisture content, so they don't store well. If you have a variety of onions on hand, be sure to use these first. To extend the storage life of sweet onions, the National Onion Council recommends wrapping each onion in a paper towel and keeping them in your refrigerator. Even if you do this, you'll still need to use your sweet onions within a few weeks; all that moisture makes them prone to mold. Toss (or compost) your onions sooner, if you see signs of mold. Inspect all onions for soft spots, mold or other signs of damage. Only perfect onions are suitable for long-term storage. If they are already sprouting, don't think of storing them - use them immediately. Cut off the legs from a clean pair of pantyhose. Drop an onion into the foot of the first leg, and tie a knot. Continue adding onions and tying knots until both legs are full. Hang the pantyhose in a cool, dry place (a location with a temperature between 40-45° is ideal). When you need an onion, simply cut a slit in the side of one of the tied off sections. This will allow you to reuse the pantyhose again and again. Next time, just slip an onion into the section via the slit. If the onions are homegrown, cure them before storing them. They'll mold if you don't. Avoid storing onions near other produce. Many fruits and vegetables will absorb the onion's flavor. Onions can also be stored in mesh bags or long braids. Expect your onions to last up to eight months in storage. Inspect them often, and remove any that appear to be going bad, so they don't cause the rest of the onions to deteriorate. While most dry onions store well, some varieties store better than others. Generally, it's the driest varieties that store best. It is an urban legend that cut onions are a magnet for bacteria and viruses. In fact, the cut surface of an onion is acidic and has sulfur compounds which inhibit bacteria and mold. This means it's perfectly fine to hang on to a leftover onion, whether you're dealing with half an onion, slices or chopped bits. Just store your extras in a sealed container in the refrigerator, and use them within 7 to 10 days. This advice comes directly from the USDA and the National Onion Council. You can also freeze sliced or chopped onions to use in recipes, although they won't be as crisp when thawed. Because of this, they work best in cooked dishes. You'll probably be pretty disappointed if you eat them raw. To freeze your onions, simply chop or slice them into whatever size you prefer (do not freeze them whole). Then, spread them out on a sheet pan, and flash freeze them. Once frozen, transfer your onions to a freezer bag, and squeeze out as much air as you can. 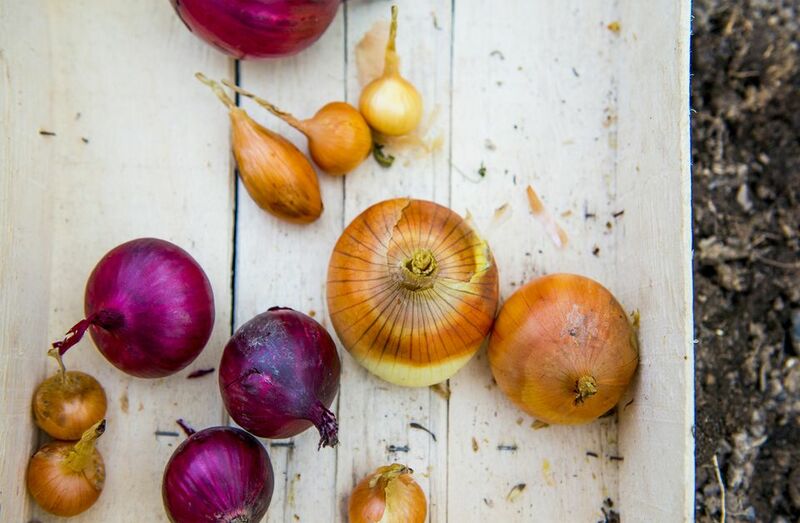 If you have a large quantity of onions to freeze, it's best to work in batches, so the onion smell doesn't overpower everything in your fridge and freezer. Their smell won't be noticeable once they're frozen, but it will be strong until then, and many frozen foods will readily absorb this scent and taste.